The strength of the Internet of Things (IoT) is in creating a connected ecosystem of different suppliers, but partnerships cannot be afforded ignoring the potential risks. “the Internet of Things is not just about creating sensors, technologies able to connect devices or a new type of box. But it is about creating an ecosystem i.e. going to companies doing business with the goal of creating value having in mind that the IoT can connect all such different components“. 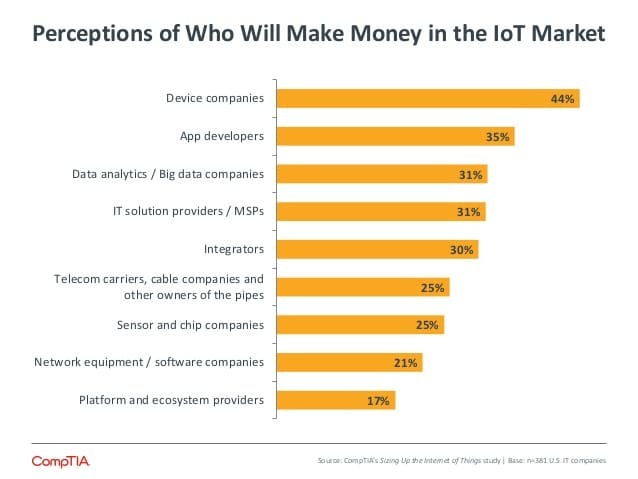 This is why there are high expectations of revenues in the Internet of Things market for solution providers, integrators and telecom carriers. On the contrary, according to the data collected by CompTia, the platform providers have the lowest expectations of revenues. And this is the major change of perspective for the IoT. Indeed, the approach so far has been to create a platform in order to have full control of Internet of Things environment. Such course of conduct has led to the creation of over 360 IoT platforms and over 100 protocols of communication between platforms which makes interoperabilities and therefore partnerships more difficult. There are technical solutions able to translate the language of different protocols of communication, but certainly this proliferation of protocols and platforms does not help. Does interoperability conflict with cybersecurity? This might be an argument that could be difficult to fully share if we consider that according to a report 80% of the code in today’s applications comes from open source libraries and frameworks whose vulnerabilities are widely ignored. Why are companies ready to use open source software, while they are reluctant in partnering with third parties to create better Internet of Things solutions? It might be that the initial goal at least by very large companies was to ensure a full control of the whole “vertical” to create a position of dominance in the market. Such solution is now questioned by many operators and even the approach taken by some smart home suppliers has been to open their products to as many protocols as possible in order to find a “win-win solution“. put in place a cyber risk policy in order to immediately react to a cyber attack and minimize the potential negative effects. Such policies and rules shall impose also obligations on the other suppliers that are part of the same solution in order to force them to adopt themselves internal policies and procedures aimed at minimizing potential cyber risks and data breaches as the vast majority of cyber attacks occur due to human errors. prove to have done everything possible to avoid the cyber attack which is crucial to limit not only the potential reputational damages, but also the potential liabilities towards third parties and authorities especially now that the EU Privacy Regulations will introduce fines up to 4% of the global turnover of the breaching entity. The Internet of Things needs partnerships, but partnerships need policies and procedures to avoid potential risks. ← Webinar – What changes for Internet of Things technologies with the EU Privacy Regulation?